K9 Furst is a sable German Shepherd born in West Germany on Nov, 2, 2008. He was imported and began to work for PCSO in 2010. Officer Oliver and Furst became partners on July 14, 2012. K9 Furst is known as a “Dual Purpose” certified K9. Officer Oliver and Furst are trained and certified in Narcotic Detection, Handler Protection and Furst is Patrol certified. Officer Oliver and Furst are assigned to the Placer County Sheriff’s Office Corrections Division and are a part of the Corrections Search Team. Together they are a recognizable force doing their part in keeping the Auburn Main Jail and the South Placer Jail drug free and safe. 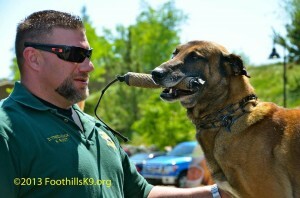 They compete in Law Enforcement K9 trials sanctioned by the WSPCA during their down time. Furst ranked 6th overall in Narcotics Detection in 2014. 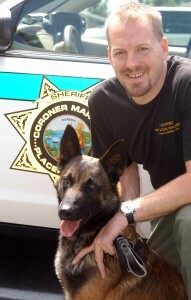 Deputy Rosner & Jet began their partnership in May 2011. Jet stepped in for Shawn’s second K-9 partner, Scout, who retired early due to health problems. Jet was born on June 2nd 2009 and like Shawn’s prior partners, Ranger and Scout, is trained in handler protection, building and area searches, tracking and narcotics detection. Jet is trained to deploy from Placer’s airship, Falcon 30 and Patrol boats Marine 1 and 6. In October of 2011 Shawn and Jet hoist certified from a Pave Hawk Helicopter with the 129th Rescue Squadron Team Hawk. Shawn & Jet are committed to their family, the Department and the community they serve! Deputy Rosner has been with the Placer County Sheriff’s Department since 1997 serving initially in Corrections and currently in Field Operations. 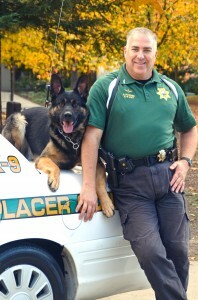 Deputy McNama has been with the Placer County Sheriff’s Department since 1993. He has been a Resident Deputy in Foresthill since 1998 and is currently a Search and Rescue Coordinator. Deputy McNama and his K9 partner “Bear” have a beat which encompasses over 500 square miles, mostly in the Tahoe National Forest. Bear was born in Belgium in 2002 and is patrol and narcotics certified. Bear’s real name is “Bero von Spitzbubezwinger”. Bear loves kids, his cat “ Tiger” and believes he is better looking than his handler. 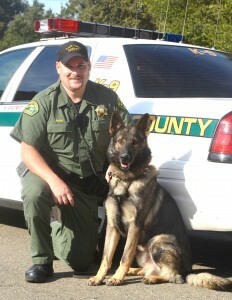 Deputy Pirtle and Eyk started as a team in May 2010 after the retirement of Fello, after 9 years of service. Born in Siegen Germany, Eyk is a 3 yr. old German Shepherd that is certified in criminal apprehension and narcotics detection. Eyk and Deputy Pirtle are assigned to the North Tahoe Sub Station in Tahoe City. Eyk and Fello live with the Pirtle family and are valued family members and a great pets. Ringo is a 2 year old German Shepherd imported from Germany. This beautiful dog not only has an engaging personality, but his proficiency in tracking, obedience and protection reflects the consistent expert training he has received since he was a puppy. He is a great addition to the team. Officer Fish has been with the Department since 2005. He and Rox have been partners since 2010. Rox is a 3 year old black German Shepherd. Her father, Chico, is a retired PCSO K9. Rox is certified in narcotics detection by the State of California. 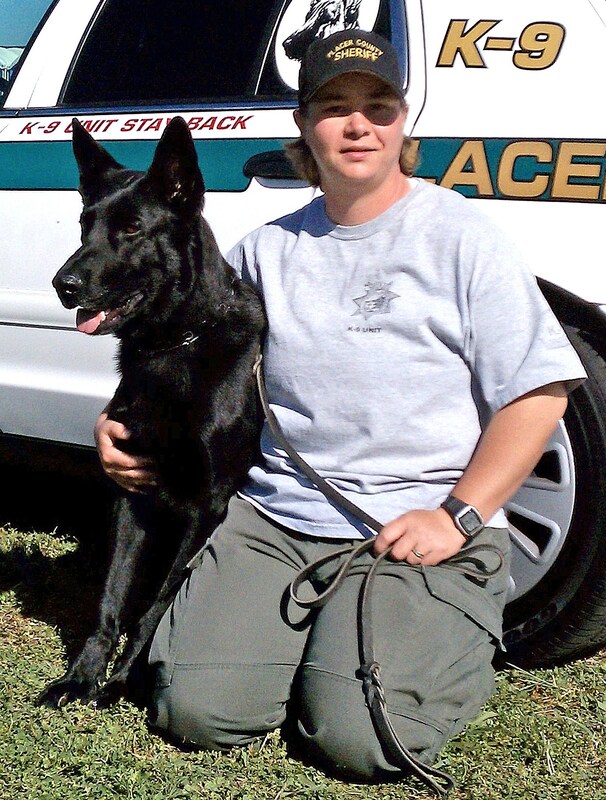 Officer Fish and Rox are assigned to the Jail,where they have been sucessful in detection of drugs. Favorite quote “Those who sit and talk about that which cannot be done are silenced by those that are doing it”.. Officer Jones has been with the Placer County Sheriff’s department since 2002. 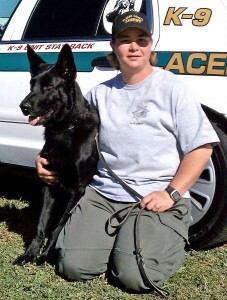 She works in the jail with K9 partner “Bo”. 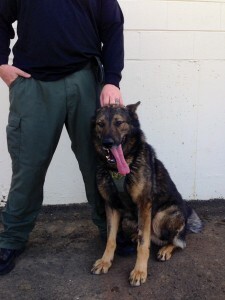 Bo is a 4yr old German Shepherd trained in narcotics detection. Bo is the son of retired PCSO K9 Chico. Bo and Sarah have been a team since 2009. Bo loves kids and playing on his days off. Bo retired in 2014, and Officer Jones is now partnered with K9 Finn. Brian and Ego have been together since April 2011. Ego is a 2 year old Belgian Malinois imported from Europe. Brian and Ego are trained in handler protection, building and area searches,tracking and narcotics detection. Ego loves kids and lives with a little dog at home. 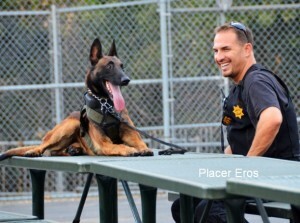 Brian originally started with the Placer County Sheriff’s Dept. in 1995 as a Reserve Officer. He then served as a Federal Air Marshal in New York before returning to California.